Deer Crossing Camp is located on the shore of Loon Lake in Eldorado National Forest in Northern California. 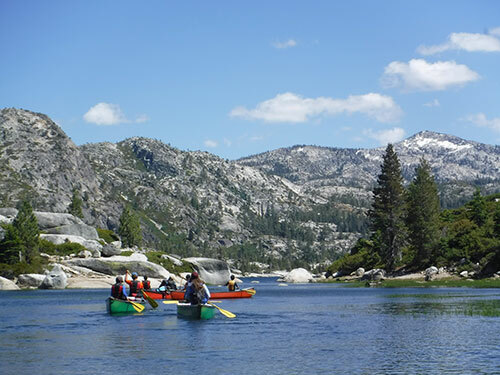 We’re west of South Lake Tahoe, in the heart of the Sierra Nevada mountain range. At an elevation of 6,410 feet, Loon Lake is surrounded by spectacular scenery. Our back door borders Desolation Wilderness, a designated preserve of towering peaks, wildflower meadows, waterfalls, and over 120 lakes. Winds across Loon Lake make for great sailing and windsurfing. Towering Jeffery pines turn campers into tree-climbing squirrels. And we are surrounded by granite walls of all heights for aspiring rock climbers. This is a wilderness camp. There is no road access. 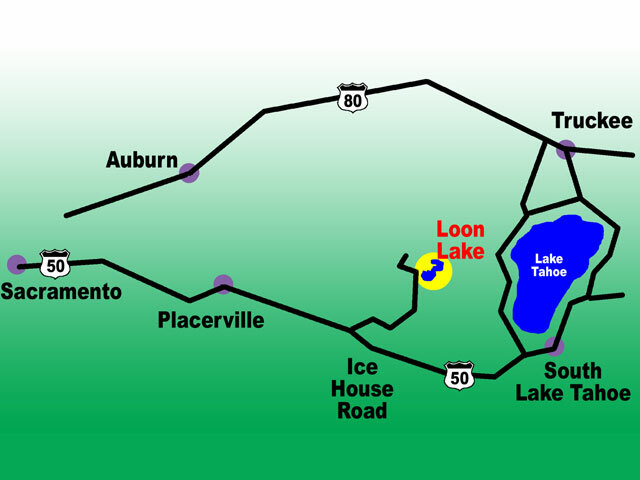 Ice House Road ends at Loon Lake’s main public campground. From there, Deer Crossing Camp is 2.5 miles (4 km) down lake. Campers hike in to camp. Their gear—as well as food, supplies, and everything else needed at camp—are delivered by boat. Completely off the grid, we generate our own electricity, pump our own water, and maintain our section of forest. For camp business and emergencies, we use a satellite dish for Internet access and satellite phones. There is no cellphone service or landline phone. Campers should expect to leave behind all electronic equipment, make their own music, and dry their hair in the breeze. Because we are a boat ride plus 80-minute drive from the nearest town, mail is picked up and dropped off once a week, sometimes more often. Originally built in the 1960s for the Boy Scouts, the main lodge has been described as a cross between an upside-down ark and a small cathedral. Perched on a granite knoll overlooking the lake, it includes the kitchen and dining hall, boys’ and girls’ bathrooms with hot showers and flush toilets, staff training room, first aid room, workshop, and storage. Campers and instructors sleep in the forest behind the lodge in platform tents. Tents house 2–5 campers and are furnished with mattresses. 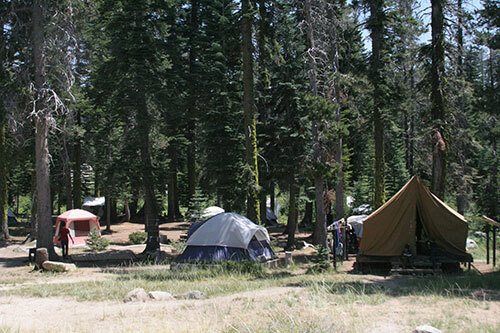 Younger campers live in tents closer to the lodge, while older campers’ tents are set farther back in the forest. Boys’ and girls’ tenting areas are separate and supervised. Friends may request to share the same tent. Instructors are housed in their own tents, spaced throughout the camper tenting areas.